*Note: we used lactose-free cheese in this recipe, so not actually vegan. However the recipe is easily made vegan by substituting the cheese. Soak corn husks in hot water. They float, so use something heavy to keep them under water. We soaked for about an hour and husks turned out fine. Mix dry ingredients (not including corn husks). I started this process in my Cuisinart but quickly realized it lacks adequate capacity and had to mix by hand. Add in the butter, cut into smaller chunks. Mix in bouillon + water until evenly mixed. I initially did not have the extra 1/4 cup of water but the dough felt dry. Probably fine to use slightly more or less water as needed. Cover dough and place in refrigerator for 30 minutes. Remove husks from water and allow to dry slightly. We did not dry them more than just shaking over the sink as needed. Form dough into rectangle on corn husk. The “top” of the tamale should run parallel to the wide end of the husk, leaving about 1/2 inch between end of tamale and end of husk. Spread filling in a line through the center of the dough. Wrap corn husk like a cigar, fold up the bottom edge, and tie with a strip from an extra husk to prevent from unrolling. Place tamales in a steaming basket with the open side of the wrap facing up. Add 1-2 cups of water in the instant pot and steam in instant pot with vent sealed for 20 minutes. Then manually (but carefully!) vent steam – no need to do a natural release. We ended up with 14 delicious tamales. I would try to spread the dough more thinly next time to make a 15th tamale, which is about the maximum I can fit in my steamer basket. We topped the tamales with homemade tomatillo salsa (recipe to follow). 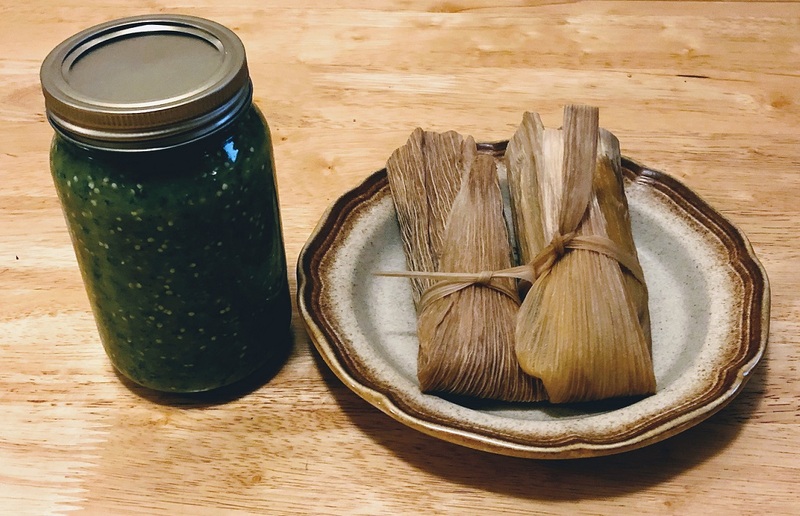 I plan to update this recipe to improve accuracy and add tips as we will definitely be making these tamales again.